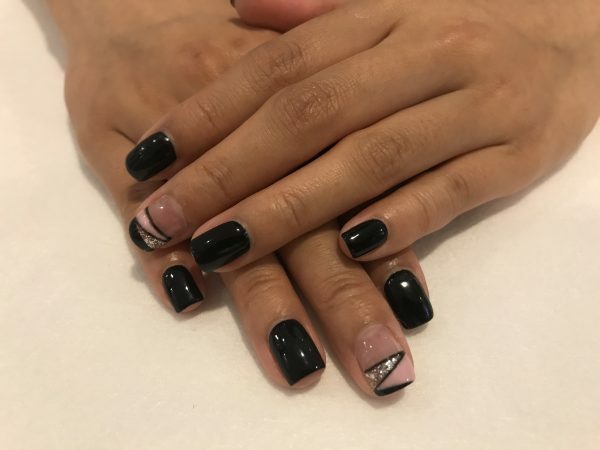 Accentuate your nail with a stylish design using CND Shellac. You will need these two shades – CND Cake Pop and CND Black Pool. First, draw a few lines with black pool on the nail. Fill up one of the geometrical area with Cake Pop by using a nail art pen. Then clean the pen and dip some top coat to stick on some glitter in another area. After this, fill up one more area withBlack Pool. The final step is to bring out the lines by going over with Black Pool. There you go! It does not take long to master the technique. Once you have it, feel free to be creative and playful with the design!